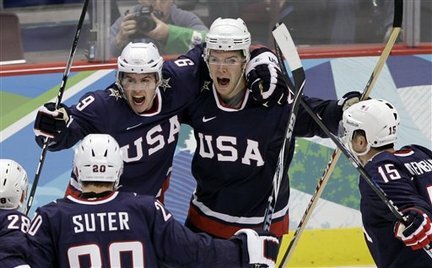 Team USA celbrating after Zach Parise's (9) goal against Switzerland. This is the gold medal game that every American and Canadian has dreamed of. This is arguably better than the 1980 Miracle on ice, when the USA beat the Soviets, and went on to beat Finland and win gold. Heading into the 2010 Vancouver Winter Olympics, no one thought that the Americans would make it this far. For Canada it was a different story. They were the heavy favorites to win the gold, and still are. In the group play of the tournament, Team USA defeated Team Canada five to three. Unfortunately the Americans have not seen what Canada is capable of, as they played poorly against the USA. Even though the Americans came away with the victory they were not playing their best hockey either. The main reason they won was due to the play of goaltender Ryan Miller. The Canadians out shot the USA 45 to 23. The General Manager of team USA, Brian Burke, was not happy with his team’s play. He believes that his team needs to be better in order to use their seeding as an advantage and earn a medal. Burke is absolutely right. Before the six to one victory against Finland to advance to the gold medal game, top players Paul Stastny, Phil Kessel, and Patrick Kane have been pretty quiet. Kane and Stastny both had two points against the Fins. Team USA’s best players thus far have been forward Zach Parise, defenseman Brian Rafalski, and goalie Ryan Miller. Other players have been playing pretty solid to, but in order for them to win gold they are going to need everyone on the same page. A statistic going into the gold medal game that the USA hopes to continue is scoring the first goal in every game so far. They have not fallen behind at any point in the tournament. Getting on the board first is what the Americans need to get the momentum going their way. Everyone is going to have to do their part in this game for the USA, in order to beat Canada. Canada has been on a roll since their lost to the Americans. They came out and defeated the Russians, who many thought would meet the Canadians in the gold medal game. The Canadians played at the level they should have been after defeating Russia seven to three, eliminating them from the tournament. The Canadians beat Slovakia in the semi-finals to advance to the finals. The game against Canada is not going to be like the first meeting for the USA. The one thing that Canadians hate most is when they lose to Americans in hockey. Trust me I have been there. Team Canada is not going to let that happen again and is going to come out hard, with a home crowd behind their back. Once again the Americans are the under dog going in to this game, despite beating Canada. Realistically Canada is the better team, but any team can win on any given day, especially in tournament play. The Americans are going to need to come out and set the tone. Sending hard hitter Dustin Brown out there to make some big hits might be a good way to get started. Most importantly they are going to need their star players to show up. Hopefully Stastny and Kane will carry on their strong play form the Finland game. Ryan Miller is also going to need to play a big game, because he was the main reason they won the first meeting with Canada. Stopping all four of Canada’s lines is not going to be easy, but the Americans are capable of doing it. Thinking realistically Canada has the best chance to win and they would be my prediction, but I am still rooting for the USA. Nothing is better to see Canadians upset about losing to Americans, especially overly patriotic ice hockey commentator for CBC and co-host of Coaches Corner, Don Cherry. LETS GO USA!!! This entry was posted in Hockey and tagged america, americans, brian burke, Canada, canadians, don cherry, finals, gold, gold medal, gold medal game, Hockey, ice, ice hockey, kane, kessell, miller, olypmics, patrick kane, paul stastny, phil, phil kessell, ron wilson, ryan, ryan miller, stastny, USA, vancouver, Winter Olympics. Bookmark the permalink. I really liked your use of links in this post. this is also a very intresting topic and very hot right now. I like how you compared this years olympics to back in the miracle on ice days!